In researching this coaching tball drills post, I did a Google search for “coach tee ball”, and one of the Google pre-populated search terms that came up was “coach tee ball without going insane “. Apparently, there’s a book being sold on Amazon with the same title by a Robert Doss…who knew. You may remember [son] Lawrence in this post titled, “How 175-LB 15yo Is Consistently Hitting The Ball 400-FT With…BBCOR & Wood“. Well now Lawrence is hitting those ugly yellow dimple balls out during batting practice. He’s hitting baseballs over 360-feet…off a tee! He’s registering over 94 to 96-mph off a regular tee using a PocketRadar . He’s also hit balls in games over 425-feet. By the way, he’s about 6-foot, 1-inch, 180-pounds…and gets mistaken for a college Freshmen during unofficial visits, but he’s a Sophomore in High School!! Let me repeat…so now [dad] Lawrence is trying to coach his TWO TWIN 7YO DAUGHTERS…yes, A LOT of patience needed. In this post, I wanted to share with you advice I offered [dad] Lawrence over the phone about “how to coach tee ball without going insane”. I know some of you coaches out there can offer some advice as well, so please share below in the comments. I prefer Headspace, which I’ve been using over the past couple years. Minimal investment of money, and between 2 to 20-mins investment of your time each day. Helps me focus better, think clearer, expose my creativity, and especially for coaching tee ball – become more aware when you’re losing it, so you can relax in a shorter period of time. It’s totally transformed my interaction with my wife, kids, and hitters. Right hand side long tail = above average “learn-ability” athletes, take a very short time to learn something new (these are few). Most of your tball drills and expectations should be setup for the majority middle bell curve. You’ll then want to have a regression-progression plan for your below and above average learners, which we’ll discuss later in this post. The point is, set reasonable expectations, and understand what you’re up against. If you haven’t noticed, kids pick up on frustration pretty quickly. And oftentimes you can’t fool them. Believe it or not, kids just want their adult counter-parts to be happy. Studies show that when hot tempered anger or animated frustration enters the mix, learning stops. The focus falls onto survival. I highly recommend her book Growth Mindset: The New Psychology Of Success . The power of “yet” will help mold your tball drills to be growth mindset oriented. Think back to when your kids were learning to walk. Did you teach them a thing or two on how to do it? What cues did you use? Internal ones? External? “Walk as hard as you can, as far as you can” cues? NO! Figure It Out (or FIO) and Gravity were their best teachers. The best tball drills are designed with failure in mind. A LOT of it. Swing and miss. Swing and miss. Swing and miss. And multiple that by 100 at this age! I’m here to tell you, it’s okay. They’re 4, 5, or 6 years old. Even one of the best hitters to ever play the game said hitting a ball is one of the hardest things to do in any sport – Ted William. You can’t get 7 wrong on a school test and climb the education ladder. Hall of Famers get it right 3 out of 10 times in baseball. Keep on a poker face (hold the judgement), give positive reinforcement during tball drills when they get a productive outcome, and encourage the heck out of them. Play games at the end of practice like Total Bases, Last Man (or Woman) Standing, Russian Baseball (kind of like cricket), or any other fun game. Use it as a reward if they get their work done. Speaking of which, tball drills MUST not go any longer than 60-mins (preferably 45-mins). Adults forget 4-6 year olds have the equivalent attention span of a gnat. Keep practices short and sweet. I like to “flirt” with my players and hitters…not in a romantic way, you weirdo! In a playful way. I tease my Middle School and High School hitters about the video game Fortnight, and how all the pretty girls are looking to get 100,000 signatures on a petition to ban the video game because it’s robbing them of their “guy time”. When we’re talking about running to different bases with the tee ballers, they learn about 1st base, 2nd base, 3rd base, and FOURTH base…wait minute, is that right?! I ask them if they have the key to the batter’s box. Or if they could fetch me the box of curve-balls. I tease the heck out of them on down times. Keep them loose and on their toes. The best resource for this is the book by Karen Pryor titled, Don’t Shoot The Dog: The New Art Of Teaching And Training. Karen has trained dolphins, horses, dogs, and humans. This form of training has taught chickens to turn the page of a book. True story! And trained two pigeons to play ping-pong. Another true story! Studies show we’re driven more by positive than negative reinforcement. That’s not to say negative reinforcement training isn’t effective, because it is…give one chimpanzee an apple, then take it away, and they’re peeved! Give another chimpanzee two apples, then take only one away, and they’re just as peeved! However, if you want to build lasting habits, positive reinforcement training is the way to go. My 5yo boy Noah gets any $1-2 candy at 7-Eleven immediately after school. He also gets an ice cream scoop immediately after going to his gymnastics training. He earns stickers for doing productive things, and after earning 10 stickers, he gets a toy of his choice within financial reason. For the boring redundant parts of my business I play my favorite music in the background (right now it’s Eric Church, songs: “Talladega”, “Springsteen” & “Record Year”), and most times have a sweet green tea within reach. Karen Pryor told a story in her book Don’t Shoot The Dog, of when her daughter took a night class for working professionals. The Professor would always start the class off with the “Who finished last night’s homework?” question. Only 25% of the class would raise their hands. She’d then lectured the class on the importance of doing their homework. After one of the classes in private, Karen’s daughter talked the Professor into praising those who did do their homework instead of belittling those who didn’t. After about of week of using positive reinforcement training, 75% of the class were raising their hands after the “who turned in their homework” question. You MUST read Karen Pryor’s book. Your coaching will never be the same. Above is my 5yo boy Noah hitting a Smushball laser in a Backspin Tee with a Ropebat. Look at him ‘show those numbers’! Remember, they’re 4, 5, and 6 years old. I have local and online lesson requests from parents with kids in this age range I turn down. And by the way, it’s possible to teach a 2yo how to hit a moving ball. I did with my son Noah. Not forced. He loved the movie Sandlot at the time and got a little tee ball set for his birthday. 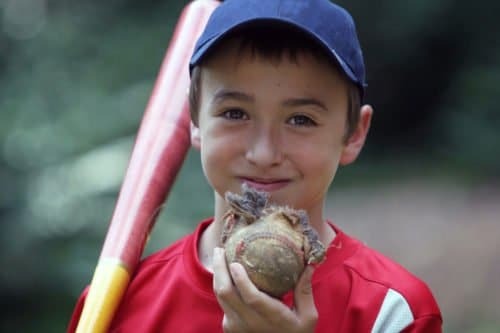 CLICK HERE for a post on how I progressed him to hitting an under-hand thrown baseball sized whiffle ball using a long slim yellow whiffle ball bat. Being athletic in their stance. Bend at waist, chest over toes. Bend in the knees. Start that way and maintain that position to stride landing. It’s easier to teach if they’re playing other sports like soccer, basketball, gymnastics, dance, and/or martial arts. Grip on the bat. Handle of the bat lines up in the middle of the hand – base of the finger tips, top meat of the hand. I’m not even concerned if their hands are together at this stage. Balance when swinging. They should not be falling toward or away from the plate. However, we may use these cues to correct one side of the extreme. In other words, if they’re falling away from the plate, then I would tell them to fall towards the plate, to get them to balance. Fungo toss is great as a progression. Hitter tosses ball up to him or herself and tries to hit it before it hits the ground. That’s just about how technical I get with tball drills for hitting. We do a lot of external cuing. Hit the ball over there. Hit the ball up or down there. Hit the top half of the ball. Hit the bottom half of the ball. Hit the ball in on your hands. Hit the ball off the end of the bat. Hit the ball in the middle (sweet spot). Try hitting this ball with this heavy bat. Try hitting the ball with this Easton Pro Stix whiffle ball bat. We hit from different distances providing we’re progressing to LIVE toss. Reverse strike zone drill where they’re swinging at “balls” and taking “strikes”…they like it when I bounce it and they have to hit it! What’s important is for them to try different ways. Hitting off tee is essential at first, but slowly shrink the diameter of the bat, moving the tee up or down after every swing, and use different size and colored balls. Variance if your coaching tball drills friend. Once they’re consistent hitting the ball off the tee, grab the fat plastic bat and beach balls! Start underhand tossing, and as they start hitting the ball more often, then slowly shrink the ball down to baseball sized whiffles. Once they’re hitting those whiffles with the fat barrel plastic bat, then start slowly shrinking the barrel diameter down.